Osaka Castle is one of Japan's most famous landmarks. It was built in 1583 and played a major role in the unification of Japan during the sixteenth century. 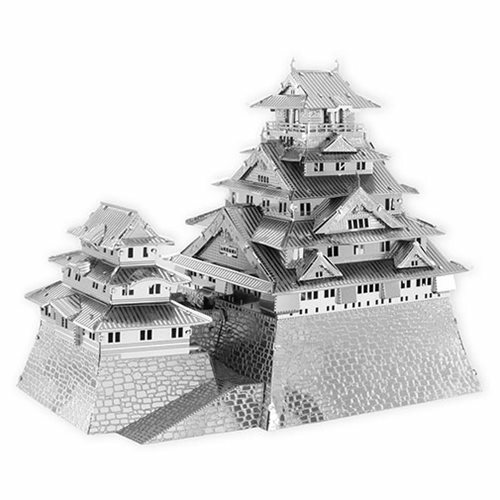 Now you can assemble the stunning structure with ease with this Osaka Castle Metal Earth Iconx Model Kit from Fascinations! This amazingly detailed DIY model starts as a 4-inch square steel sheet and finish an amazing 3-D model. Use the easy-to-follow instructions included with the sheet to pop out the pieces, bend the tabs, and connect them at the attachment points! Includes 2 metal sheets and a challenging difficulty. After assembly, model measures about 3 1/2-inches tall x 4-inches long.